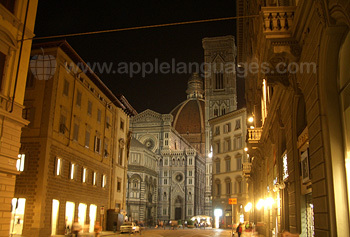 Learn Italian in Florence, one of our most popular schools in Italy! 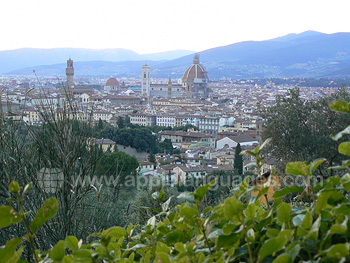 Since the middle ages, Florence has been a cultural hub, attracting writers, artists, architects and scholars. The monuments of this cultural and historic legacy are still visible in Florence's many palaces, churches and museums and no visit to Florence would be complete without a visit to the Uffizi Gallery and Palazzo Pitti. Students who take an Italian course in Florence study in the city's historic centre, surrounded by Italian culture and Rennaissance history. 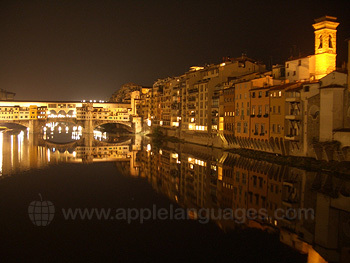 Our Italian language school is ideally located, just 5 minutes’ walk from the most famous bridge in Italy – the Ponte Vecchio. 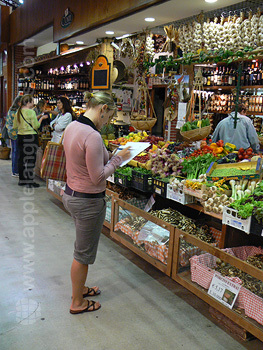 This amazing location makes it easy to discover the beautiful city of Florence and when you are not in lessons, you will be able to practice your new Italian skills as you explore! 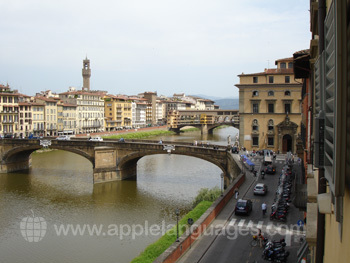 Our Italian school Is situated in the very centre of Florence, within a refurbished 17th century palace on the banks of the River Arno, just 5 minutes’ walk from the world-famous Ponte Vecchio Bridge. 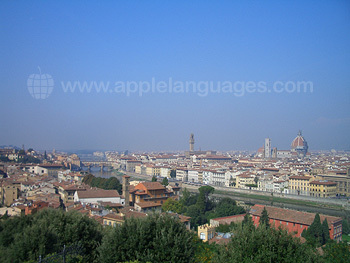 There are 10 well-equipped classrooms in the school, all with air-conditioning and several with magnificent views over Florence. There is Wi-Fi access available throughout the school building. 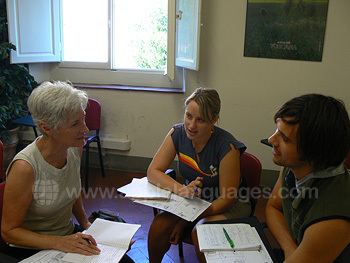 Immerse yourself in the Italian language with our Intensive course consisting of 20 or 24 lessons per week, or if you want to learn as much Italian as possible during your stay in Florence, take a Super Intensive Italian language course of 30 lessons per week! Each lesson is 50 minutes in duration and has a maximum class size of just 12 students. 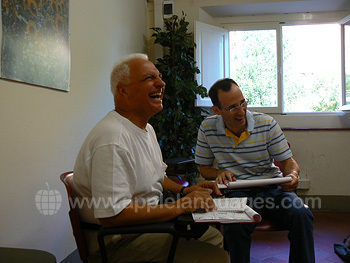 Private lessons are also available, where you can benefit from personal attention from your teacher and target any specific areas in your Italian practice. You can even combine group lessons with individual tuition on an Intensive + Private lessons course. Students with a love of Italian food and wines (and who doesn't!) can take our Intensive + Cookery course. This course combines Italian language lessons with practical cookery sessions held at a professional cookery school, where you will learn to make traditional Italian dishes! Those with an interest in business and international trade can take our Business Italian Course, which covers economic and business terminology and is a perfect choice for anyone who would like to improve their Italian skills within a business context. Our school in Florence also runs Italian Club 50+ courses, which will allow you to combine your Italian learning with a programme of cultural activities. 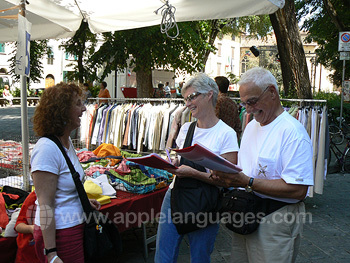 This course is suited to students aged 50 and above, who prefer to learn Italian uniquely with like-minded students of a similar age. 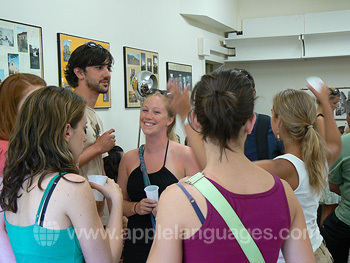 Our school in Florence advises students who want to learn Italian as quickly as possible to stay with one of their carefully-selected Italian host families. Choose bed and breakfast for a more independent experience or half-board where you will enjoy two delicious home-cooked meals each day! 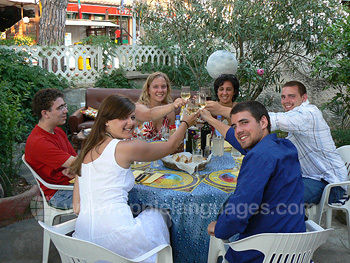 Our Italian language school in Florence arranges accommodation in self-catering shared apartments, where you will share with other students from our school or with the owner of the apartment. We can also arrange private studio apartments, comprised of a bed, kitchenette and bathroom. Our school in Florence also offers an extensive cultural program to give students the chance to immerse themselves in Italian culture and socialise with fellow students. Activities vary, but may include guided tours of Florence, Italian film evenings, trips to the theatre and full day excursions to other locations in Tuscany. Our Italian language school in Florence can arrange airport transfers from Florence Airport or Train station, which will take you directly to your accommodation at an additional cost. Average score for our school in Florence based on 108 previous client reviews. I really enjoyed the atmosphere at the school. Friendly people that are always there to help you. I didn’t give a 5 because the class only worked with the book. Next time, I would love to have a change in the teaching style. Still, it did not feel like going to a normal/boring school at all! I had the pleasure to stay with a very kind, patient, open and interested family. The 15 minute walk to the school was perfect. I really enjoyed meeting new people, and it was just as good as last time! My host was lovely again, and cooked me wonderful dinners! Very professional and friendly-would thoroughly recommend this school. I learnt a lot, and loved having half a day to look around Florence. The course was a good speed and we covered many topics in such a short time. The extra private lessons were also amazing and the teaching was excellent. In a two weeks course, the manner how to teach the language was very efficient. The course was interesting and fun. The teachers are amazing and so helpful. They could not be nicer. It was a wonderful experience. I lived in an apartment by myself. It was in the city center and was a perfect place to stay. It had everything you could ever ask for and a great location. If I ever go back I would love to live here once again. In total it was an amazing and fun experience. The teachers were enthusiastic and very helpful making even an intensive course like mine seem very light and interesting regardless of having six hours a day. The apartment was very centrally located and close to the school. The landlady and her husband were so friendly they invited us round their house for dinner! The course was great. The teacher was cheerful and helpful and the lessons were fun. I appreciated that efforts were made to provide morning lessons (which most people preferred) as well as afternoon. There were some extra activities offered and the atmosphere was very easy and friendly. I really liked the apartment in the residence Mannaioni. The self-catering was ideal for a two week stay. The apartment was secure and extremely well located - for sightseeing and in relation to the school. I really liked the pace and variety provided by my course, and my teacher was fantastic! The accommodation was very nice and not too far from the centre so it was really easy to get into school. We had a wonderful teacher who made understanding the spoken word virtually painless. He was extremely patient and knowledgeable in his field. My last day I had two private classes with Valentina Venella. 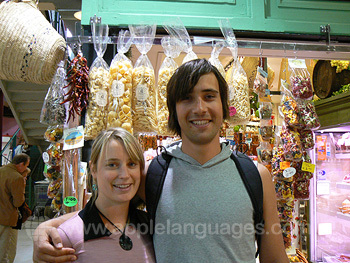 She is extremely skilled in teaching Italian as a second language. I was VERY impressed. She helped me enormously to put certain pieces of the puzzle together that made everything "click". Excellent teacher, well-paced structure, relaxed atmosphere. The accommodation was perfect - in centre of town, friendly landlady, all the facilities I needed. Excellent course and excellent staff. My teacher Domenica was exceptional with beginners. Accommodation facility was great as was the proximity to school. The lessons were extremely well planned for all levels.. The school was extremely well run, and provided extra circular activities for students which were not expected. Well Done. Accommodation was just amazing, very central, clean and my Italian landlady was very friendly and helpful. The course was challenging but very enjoyable. My classes were in the afternoon and I would have prefered them to be in the morning but that was just how it worked out. The teacher was excellent and very friendly. All the staff were really helpful. They took trouble to make sure you were happy with everything and organised some extra free activities. My confidence in the language improved enormously. I opted for a 'home-stay'. I stayed in a really nice room (en suite) in an apartment in the old town just 5 minutes from the school. I valued the opportunity to talk with the owner over dinner - extra practice! I was only there for a week but learned alot and would recommed your school highly. I thoroughly enjoyed the course and wished it was possible for me to have attended for a further week. I would like to go back for further studying. I was very happy there. However what was packed into the week was excellent. All the staff were so friendly and helpful. I am all the more determined to continue to improve my skills. My courses was really good, as my teachers. The school and its staff was friendly and helpful. Really really nice accommodation, in the center of Florence, everything was okay and the landlady was welcoming. The atmosphere was great in lessons. It was positive, with a good work rate but relaxed and well organised. My individual lessons were excellent, I really improved as a result of the course; my Italian teacher noticed on my first lesson back! Ifeel much more confident with my Italian. The host made a real effort with the evening meal (three courses of proper home- cooked italian food,)and ate with us too. The accomodation was brilliantly located for both the school and cultural centre of Florence and was welcoming and well kept. Excellent teacher (Laura). Good variety of activities. Lessons easily accessible even though delivered in the target language from the start. The whole experience was positive and I hope to do another course in the future. I also found the mixed age and nationality of the participants interesting. Actually, I should have stayed longer than one week to learn more because the course was really interesting even from a cultural point of view. I enjoyed my stay very very much!! My hostess was absolutely charming, we talked a lot together; I really had a wonderful stay!! Course was very good, learnt language at phenomonal speed, thoroughly enjoyed it. Lovely appartment, shame it was a bit far out of the centre of Florence, next time would prefer something a bit closer, but apart from that it was perfect! Course was very enjoyable, good speaking classes, helped me improve my italian, and my confidence in speaking italian, a lot. It is a pleasant school in a superb location, friendly teachers too. I found the course to be quite useful, and the instructor, Donata Caccavale was amazing as a teacher. She could not be better. I thoroughly enjoyed my course and especially my teacher, Laura. She was amazing in teaching us the basics and went beyond to help us anyway she could. Her patience and ability to explain everything helped me greatly in my quest to learn Italian. My accomodations were great. The apartment was spacious,modern and clean. As a lecturer in higher education in Ireland, I commend all the staff at the school in Florence warmly for their dedication to their subject and students. I thoroughly enjoyed the course and Laura and Rita's (teachers) enthusiasm certainly rubbed off on me. I stayed with an Italian couple in Florence who were excellent hosts, very friendly, helpful and above all made me very welcome in their home. It really was very impressive. First of all the school itself is in an utterly charming and central location - my classroom had views of the Ponte Vecchio. All the staff were very friendly and the whole operation was professional and well organised. Above all the teachers themselves were quite special - incredibly charismatic and entertaining - they made the learning experience a pleasure. I went for a weeks course just before christmas and at the end on the Friday, all the staff / teachers and pupils gathered for prosecco and slices of panettone - it was very touching. Very good course. Text book not very helpful, teacher a winner. Didn't know what to expect and it was great. The balance of language lessons and outings paritcularly the art lectures made it v special. I felt I learned a lot in that week and would love to do it all over again! The fact that we were all of a roughly similar standard helped. Wonderfully close but an eclectic mix of crockery etc! Not helpful that we were not provided with washing up liquid. Cleaner was much too over enthusiastic (didn't want one anyway) and threw things away which was a problem. However comfortable and v v handy for the school. Atmosphere was terrific. enough free time and Florence is lovely anyway. It was good fun. The conversation class was nice and small (4 or 5 students) and the quality of teaching excellent. My hosts were very nice and welcoming. We spent a lot of time speaking Italian about all sorts of subjects. I came away feeling I had learned a lot. The hostess had been an English teacher and was also a good cook, so all in all it was a most enjoyable experience. Both teachers I had (Marco + Rita) were excellent teachers and also very friendly. I felt I was able to make considerable progress with my Italian. It was also very enjoyable meeting my fellow students. I was welcomed very warmly at my host family, Mrs Beatrice Brizzi, who is an outstanding cook! She also helped me a lot with improving my Italian. Her beautiful house and garden were an added bonus. Trinita was an excellent teacher and gave us information about Italy, Italian culture and of course not forgetting the grammar. I wish I had stayed for 2 weeks and not just the 1 week. Lorenzo showed us into our appartment and he explained everything. The appartment in via Trebbio was in a good position and there were no problems. Good course, teacher, team and visits. Fully occupied each day. Cookery course was great fun and we enjoyed our meal. Lorenzo our landlord was helpful and efficient and easily contactable. Great apartment, very central and commodious. Would recommend it. Such a beautiful city in which to learn and sight see. Our bus trip to Fiesole the day before the course was wonderful and only 1,2 euro each way. My course had very good teaching and I was fortunate to be placed in small groups (6 in week 1 & 4 in week 2). The optional classes offered each Thursday evening were particularly well taught. Firenze is a wonderful city - so atmospheric. Overall, the course was great. The staff were friendly. Exactly what I needed - lots of conversation with the odd bit of grammar. Business Italian classes were great - really tailored to my job. Lovely family, great food, beautiful house! 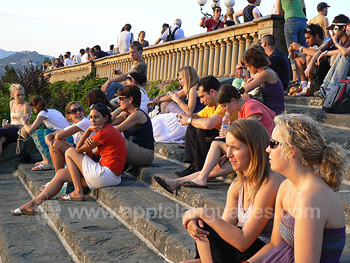 The school in Florence is situated in a fairytale setting in the Santo Spirito area of the Oltrarno- right on the bank of the Arno with views of the Ponte Vecchio. Attending the school was a perfect way to enjoy all the delights of this exquisite city without feeling like a tourist. My course was great! 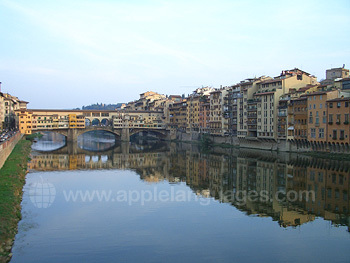 I studied in Florence for two weeks and I really enjoyed both the school and the city itself. I had great accommodations. Close and easy walk to school. Overall, I was impressed and fully intend to repeat the experience next year! 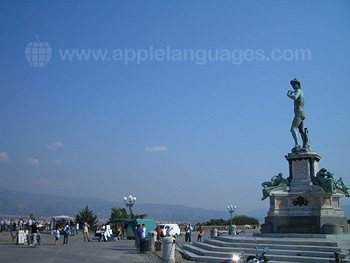 I knew no Italian when I went there and came out speaking and understanding basic Italian after only 4 weeks! The staff was helpful and knowledgeable. Florence is amazing. I traveled to Venice, Rome, and Reggio Calabria for 2-3 days each during my stay, and took a day trip to Chianti for a wine tasting hiking tour. I think Florence was by far the best of all places I saw and I highly recommend going there. The art, the history, the architecture, the hustle and bustle, the food, the beauty - wow! What a combination! It's a must-go! I would thoroughly recommend this school to anyone at any level of Italian. The course was excellent for beginners, concentrating on getting us to use the language with some confidence, very good humoured, with a patient and sympathetic tutor. The school also arranges some very useful additional units on grammar, freely available to all students irrespective of level. A very encouraging and supportive tutor, who made it very stimulating and good fun. I made a lot of progress even in a week and felt much more confident in using the language. I would definitely do this again. Our group ranged in age from 19 to 65 years of age, and we all got on together very well. I really had a great time here in Florence and I really loved the school and my apartment! I was soooo pleased by the friendly and helpful staff at your school in Florence. I had a really good host, and I had the joy of a different Tuscan meal every day, and lots of helpful hints about what to visit in Florence! The school and people were all lovely and helpful. My host was very friendly and accomodating, and the room more than adequate. Thank you for a wonderful experience and I plan to go again. I enjoyed this course, the company was good and the teacher was excellent. Excellent course, well delivered and the teacher was really good, professional, friendly and funny. Overall, a really positive week. 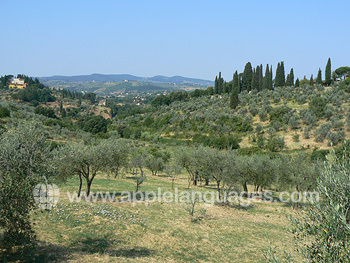 Perfect for all levels of Italian whether you are a beginner or whether you are just brushing up on your Italian. I really enjoyed the course. I will be studying Italian from scratch at university and covering level 1 plus some extra stuff..past tense etc helped me enormously. I now feel i can construct simple sentences, I can understand quite a lot and enjoyed watching films in my extra super intensive classes. My host was lovely and it was great that our accommodation was so close to the language school. I felt safe and comfortable in her home. Fantastic experience all round. I would love to come on more courses with your school. All the teachers were great. I was very impressed with the standard of teaching. Thank you so much. It was very interesting, I learnt a lot. I'd like to thank my teacher for all her help and kindness, I've never had so much fun in an Italian lesson! The family we stayed with were very nice, very welcoming, easy to talk to and we were very well fed. I loved every minute of it. The office staff were very friendly and helpful; the teachers were excellent and the view was awesome. The villa I stayed in was awesome and the house mother an excellent cook. I really enjoyed my time there and it was a pleasant walk to the school. 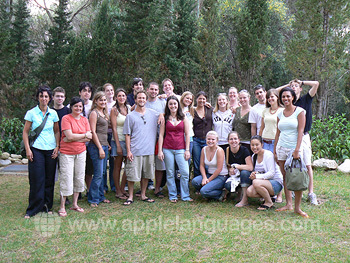 Thanks to the staff at Apple Languages. Everything was very well organized on their part! And I have already recommended the course to a friend who is coming next year! I really enjoyed the course. We had a small group of 6 for two weeks then 3/4 for following two weeks. There was plenty of opportunity to speak italian individually. It was quite intensive in last 2 weeks because of reduced number. The teacher was very skilful at drawing us out, absolutely knew her subject, and was very nice with us, we all liked her a lot. The course was a mixture of discussion and learning from situations we students were talking about and more formally using the grammar verbs etc. We also had quite a lot of homework which was good for understanding, this also formed part of the following day's lesson. I particularly liked the presentations we did, because we were different nationalities we each talked about our own country we used the board for maps,information etc and took questions from the other students and teacher. It was very interesting to do this in italian. As you can tell I loved the whole experience. It was excellent to live in Florence not to be just a tourist. We had a favourite trattoria at which I was treated as family if I went on my own.Being there for a month local people got to know me. We had a great social life especially in the first and second week. I loved the street the school was on, some veyr upmarket shops etc. 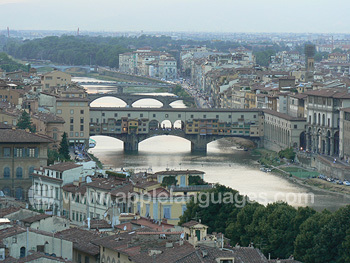 I am missing hearing the Italian language and the way of life. Excellent teacher, very friendly staff. Very friendly host family. 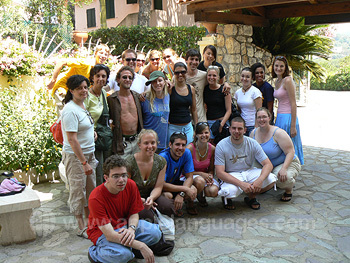 The teachers were very nice and made Italian seem easy! I learned a lot more than I thought I would. The course was really fun. I felt like I didn't know what to expect at first but as soon as I attended the first class, I felt perfectly comfortable. I couldn't have asked for a nicer host family to stay with.